I never thought it was an accurate statement. My own efforts at educating others have required that I mastered my subject before I could help others learn it. And the educators that I know are anything but unaccomplished rejects from the world of “doing”. Teaching is a special talent that requires skill mastery in addition to a special gift for imparting others with wisdom. My friend Lorie Huston was an amazing teacher. She was so good at it, you didn’t realize you were being taught when you were. You just learned. She also was an amazing “doer”. Lorie was a veterinarian who actively cared for the health needs of dogs and cats and other creatures who found their way into people’s homes as pets. Her teaching came in the form of writing. She wrote many articles for Pet MD, one of the first places people turn when they have a question about their pet. She also wrote her own blog The Pet Health Care Gazette, and she wrote for other journals and online venues. Her articles were helpful and informative and written with authority. But they were always written from the perspective of one pet lover to another. I never visited her veterinary practice in Rhode Island and my pets never were her patients. But we benefited from her wisdom. I read her articles when I needed information about concerns with my cats, and, on occasion, I asked her questions in social media. I knew Lorie personally from the annual pet bloggers’ conference BlogPaws. We would meet up each year at the conference, share pet stories, and talk about how we could best help fellow pet lovers through social media. Lorie was a quiet and gentle person, and kind to a fault. She was always smiling and putting others at ease. I always felt that I learned a lot from her each time we talked, but it never seemed like she was “teaching” me. I wish that I had told her these things. I wish that I had let her know how valuable she was to me and to others like me. I am sharing about her in past tense, because Lorie passed away yesterday. I do not know the details. All I know that some ailment caused her body to shut down. She was well and vibrant when I last saw her in May, so the news caught me by surprise. Lorie was such a low key person, you felt her presence without making a big deal about. Lorie was just always THERE. And now she’s not. It is hard to grasp. I don’t know Lorie’s family. I send them grace as they cope with their sudden loss. I hope they know how great an impact she had on so many people. Teachers do, and this teacher did a lot. She touched the lives of countless animals and the people who love them. Pet lovers often share the story of the Rainbow Bridge when a pet leaves this world. 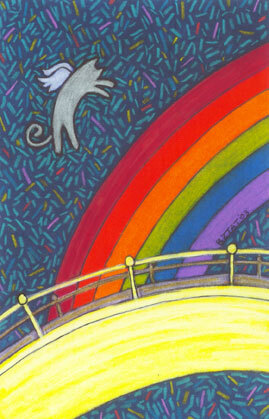 As the story goes, pets go to a special place called the Rainbow Bridge when they die. At this special place, everything is wonderful and pets play and frolic without a care in the world. When their human leaves the earth, the pets join their human in walking across the Bridge together. I am sure that Lorie had many a greeter at the Bridge. I hope their walk across was glorious. Enjoy that Rainbow Connection, my friend. You have earned it. There’s Dillon, three-legged Lilly, Merlin, Midge, Rhett and Rusty. All will need to be re-homed. It’s heartbreaking enough to think they’ve lost their cat mom, but odds are they will have to be separated into more than one home. Fortunately some of not that bonded i.e. Midge and Merlin. Please share and cross-post. For contact info, please email Dusty Rainbolt, CWA Vice-President at dustycatwriter@pobox.com. You can read about the cats and more about Lorie in her profile here. Beautifully written. You captured Lorie perfectly. Thanks Emmy. I know that you share this loss, and my heart goes out to you, my friend. We were so shocked and saddened to hear such sad news. That was a beautiful tribute to such a wonderful soul.